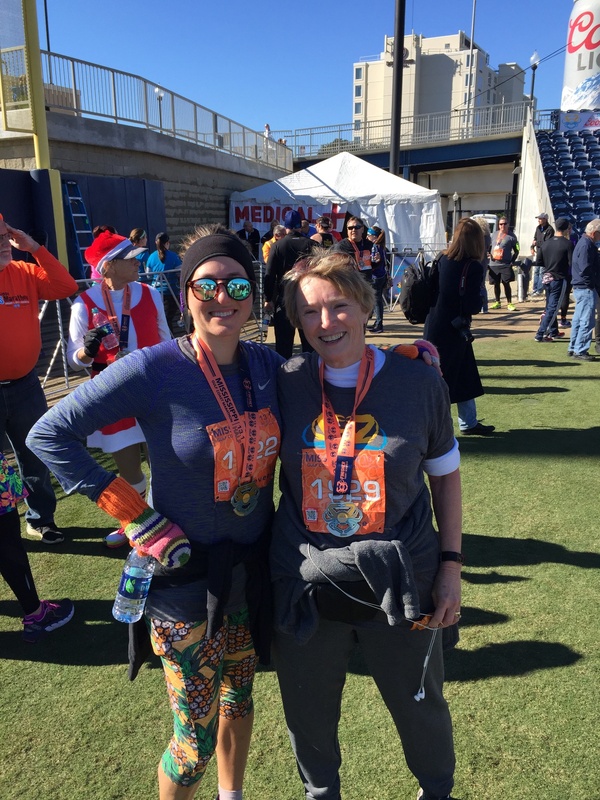 Did I Tell You I Finished A Half Marathon…. – Finish Well, LLC. I did!! 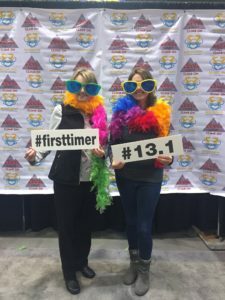 On December 10, 2017 I participated in my first half marathon. 13.1 miles. My 68 year old self did it! Now mind you I did not run, I walked. But I walked at a very fast clip. I finished 5th in my age group (65-69 yrs) walking a 14:56 mile (and that included bathroom breaks). It was fantastic!!! I have my runner daughter-in-law, Dr. Genevieve Pitchford, to thank. 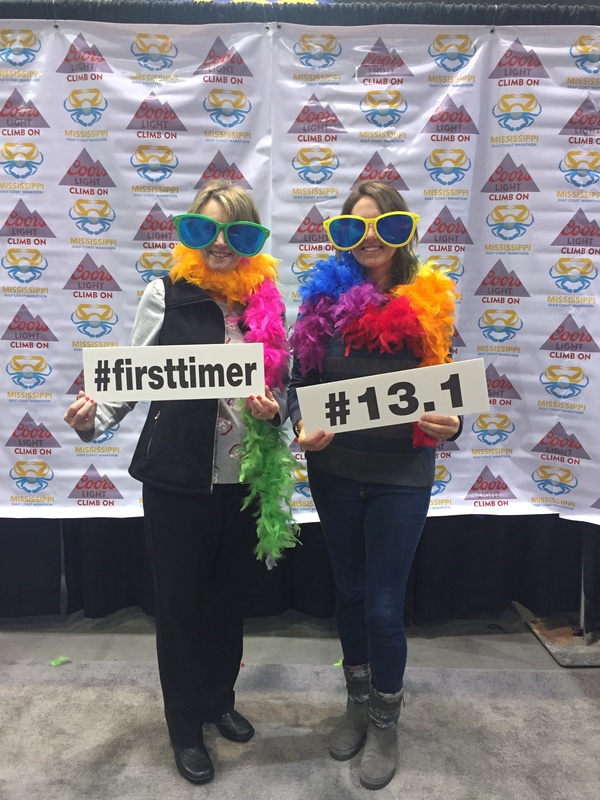 I would have never considered a half marathon without her invitation and encouragement. The thing that made the entire event so much fun was that we did it together. It still makes me smile when I think about it. The course was from Pass Christian, MS to Biloxi so we were transported by bus to Pass Christian in the dark of morning-and I do mean dark. The week before the event the weather had been balmy on the Mississippi Gulf Coast. On that particular morning-not so much. It was freezing!! Literally. Gen had purchased a cool, wild pair of running pants for me but it was too cold to wear them so I grannied up and wore my sweat pants over tights with socks on top, layers of shirts, my favorite Auburn fleece, hat, and gloves, the whole nine yards. I was not a race diva for sure. I looked more like someone who was homeless and was wearing everything they owned at once. I learned an interesting fact about marathons in the cold weather. Everyone goes to GoodWill and purchases their outer layers of clothing, their gloves, their hats. Then as the sun comes up and it warms up those clothes are stripped off and thrown on the roadside. Now don’t get alarmed thinking how wasteful that is. It isn’t. Someone then comes behind the runners/walkers and gathers up all their discards and takes them to local homeless shelters. Next time I will know. Genevieve is part of a lady’s running group and they run together frequently. They were all participating that day but like the priceless daughter-in-law she is, she stayed back with me. Best gift ever! I can’t even begin to describe the experience. It was incredible! There were over 2000 participants and there I was in the middle of them-well, not exactly the middle,more like bringing up the rear- but I was there. It felt great! I never got tired and I know I was grinning like a cheshire cat the entire way. I was almost sad when it was over. Those of you who know me well know that one of my favorite verses is II Timothy 4:7 “I have fought the good fight, I have finished the race, I have kept faith.” I just kept thinking about that verse during the walk. There are so many comparisons to a long distance walk and our journey on this earth. Here a few that particularly struck a chord with me. I was invited and I accepted the invitation. I would have never done it on my own. Genevieve’s invitation was the reason I was there. To finish our race well, to fight the good fight and keep the faith we have to accept the invitation from our Savior to walk with Him. He has invited us all but we have to open our hearts and accept that invitation. I had to be prepared. Although I did not run I still had to train. 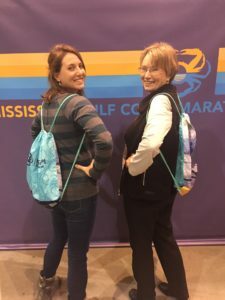 I couldn’t just take my senior self out on that course and walk 13.1 miles without having practiced, trained, conditioned whatever you want to call it. In this life our training is spending time with Him, in His word, in prayer, in fellowship. It conditions us for what lies ahead. Some things had to be shed along the way. Most participants were prepared to peel those layers off and leave them on the roadside. I was a good example of what we don’t need to do. I had to hang on to everything and in all honesty it slowed me down. I had to put my gloves in my jacket pockets, then I had to push up all those layers of sleeves, then I had to tie the jacket around my waste. I hung on to that Auburn fleece. It’s my favorite jacket! How much better if I could have not put so much value on earthly things. I had to grab some water on the way but keep on moving. We need nourishment and refreshment along the way. The journey gets long and we need to reach out to His Word and to those offering refreshing waters along the way. We don’t have to do it alone. I can’t tell you how comforting and reassuring it was that Gen was with me. I knew if I got into trouble, turned an ankle or got too tired she was right there to help me. You know, we don’t need to try to make this journey alone. God puts helpers and friends and loved ones who can keep us going when things get tough. When you cross the finish line you get a prize. I am pretty proud of that medal, yes sir, pretty proud! But that medal is nothing compared to the prize we get when we cross His finish line. Life everlasting in the presence of our Lord. No more tears, no more sorrow, no more pain, and no more goodbyes. Now those are prizes worth running for.